Physics Demonstrations in Sound & Waves is a three-part video program which presents a full range of demonstrations in the areas of sound, vibrations, and wave behavior. The vibrational modes of a resonating bell are revealed using real-time interferometric holography. 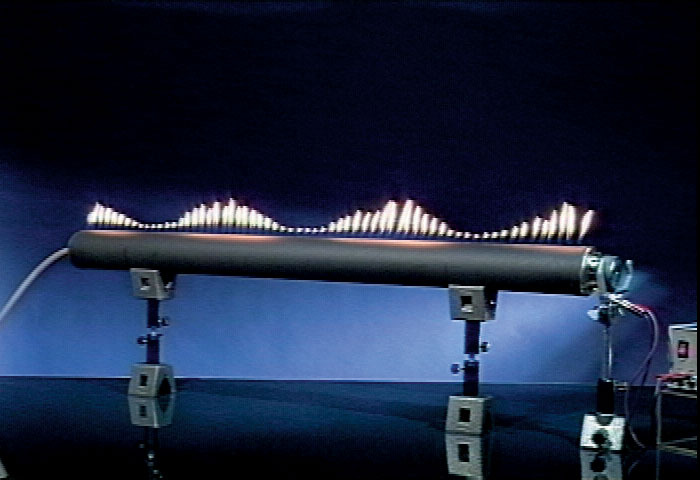 Examination of standing sound waves in a gas column using a flame tube. Slow motion observation of interfering waves on a coil spring. 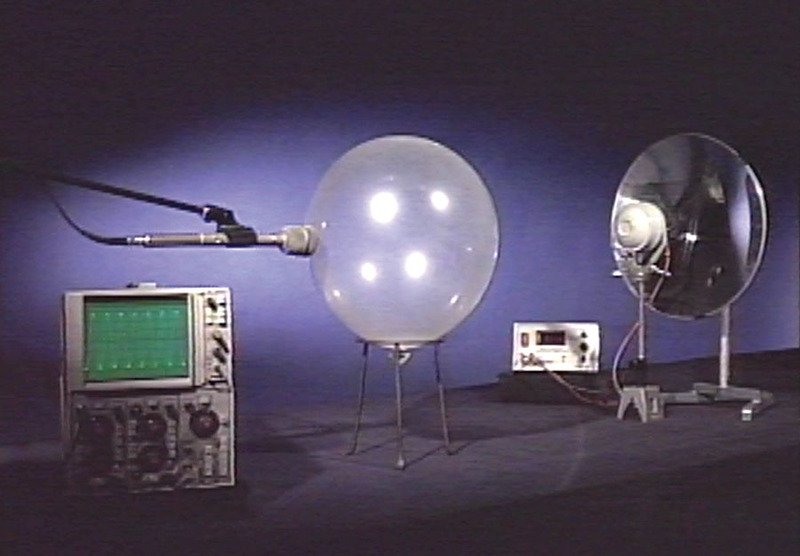 Experimental setup to observe the refraction of sound waves upon passing through a carbon dioxide filled balloon. Sampling of demonstrations, hover over image for description. Physics Demonstrations in Sound & Waves is a three-part video program which presents a full range of demonstrations in the areas of sound, vibrations, and wave behavior. The program was developed in an effort to give physics teachers a comprehensive collection of video demonstrations, supplementing the instructor’s live classroom demonstrations. Three-dimensional computer animation is used to augment many of the demonstrations, providing a graphical representation of the physical behavior. Individual demonstrations are 3 to 4 minutes in length and can be quickly accessed using the program's on-screen indexing system. The indexing system allows the teacher to select a particular demonstration and show it at the appropriate time during a unit on sound & waves. The accompanying teacher’s guide gives additional data, information, and suggestions on using the demonstrations to promote further classroom discussion. The selection of demonstrations includes those which are difficult to perform in the classroom and those requiring apparatus not readily accessible to many physics teachers. Detailed observation of the demonstrations is accomplished through use of a filming approach which focuses solely on the apparatus, allowing the teacher to utilize the program in a way which is consistent with his or her personal instructional approach. The voice over narration eliminates the on-screen presenter and allows attention to be directed to the physical behavior being studied.